This hardcover edition is out of stock, but a new paperback edition was published in 2014. Click to learn more. 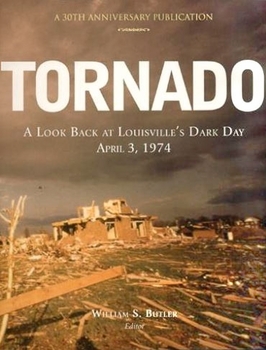 Louisville, Kentucky's recent history has no more vivid moment than the Category 4 tornado which tore a path of destruction across the city and Jefferson County on April 3, 1974. This comprehensive volume is a 30th anniversary look back at the events of that day as seen through the images of journalists, freelance photographers and ordinary people who grabbed their cameras and recorded the destruction that occurred. Complementing the photographs are the compelling personal accounts and recollections of people whose fate brought them into contact with the storm, and who lived to tell the tale.